Pininfarina's styling and engineering operations saw their turnover remaining steady during the first quarter of this year while profit margins increased. 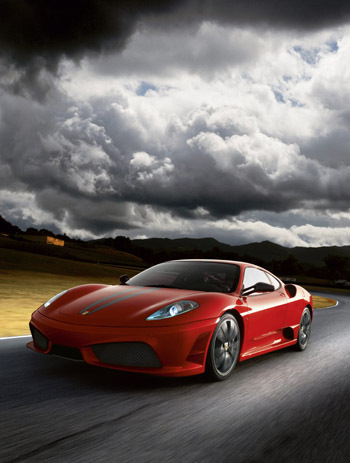 Amongst Pininfarina's current engineering workload is designing the successor the Ferrari F430 coupé (above: the 430 Scuderia version) dubbed the F450. The Board of Directors of Pininfarina S.p.A., has met under the chairmanship of Paolo Pininfarina, approved the Report on the Group’s Operations in the First Quarter of 2009. Pininfarina S.p.A. reported value of production of 61.2 million euros at March 31, 2009, down from 123.9 million euros in the first three months of 2008 (-50.6%). EBITDA, while positive by 1 million euros, were lower than the 4.1 million euros earned in the first quarter of 2008. EBIT were negative by 5.0 million euros (-5.1 million euros at March 31, 2008). The net loss decreased to 4.8 million euros, less than half the 10.7 million euros lost in the first quarter of 2008, and shareholders’ equity amounted to 21 million euros, down from 25.8 million euros at December 31, 2008. Net borrowings increased to 127.9 million euros, compared with 99.2 million euros a the end of 2008. Despite a significant reduction in turnover, the consolidated indicators of the Group’s operating performance at March 31, 2009 confirm expectations for the current year and are in line with the projections of the Industrial Plan. The comparison of the data for the first quarter of 2009 with those for the corresponding period in 2008 is affected by changes in the scope of consolidation. The main changes that occurred during the first three months of this year included the deconsolidation of the French companies D Trois SAS, Plazolles S.a.r.l. and Ceram SAS, and the disposal of the business operations of Matra Automobile Engineering SAS, a sub-holding company, and RHTU A.B., a Swedish company. In addition, the Véhicules Electriques Pininfarina – Bolloré SAS joint venture was established in the first quarter of 2008, but was not yet operational at that time. The operating and financial results of the Group in the first quarter of 2009 were in line with the guidance provided in the Report on Operations of the 2008 Annual Report with regard to the current year. The performance of the global economy and conditions in the automotive sector in particular produced a drastic reduction in the demand for goods and services. In Pininfarina’s case, the challenges posed by these negative developments were magnified by the approaching expiration of the existing manufacturing orders, which are nearing the end of their life cycles. - The number of cars manufactured in Italy during the first quarter of 2009 decreased by 63% compared with the same period last year, causing a reduction on about 60% in the value of production of the manufacturing operations. On the other hand, the styling and engineering operations, net of the changes in the scope of consolidation, succeeded in holding steady their turnover and significantly increased profit margins. - The Group continued to implement programs focused on increasing efficiency and cutting costs, which helped mitigate the negative impact of a major shortfall in turnover both on EBITDA and EBIT. - The financial benefits generated by the Rescheduling Agreement reached with the Lender Institutions had an immediate positive impact on the income statement, causing a drastic reduction in interest expense compared with the first three months of 2008. In the first quarter of 2009, value of production totalled 65.6 million euros, or 54.9% less than in the same period last year (145.5 million euros). However, it is worth noting that the companies and business operations that are no longer included in the scope of consolidation generated 16.6 million euros in value of production during the first three months of 2008. EBITDA were negative by 0.2 million euros, as against positive EBITDA of 4.4 million euros in the first quarter of 2008. The operating loss increased by 0.6 million euros, with negative EBIT amounting to 6.4 million euros (loss of 5.8 million euros at March 31, 2008). However, when comparing the 2009 and 2008 operating margins, it is important to keep in mind that EBIT for the first three months of 2008 benefited from 3.3 million euros in non-recurring gains, which were not available in the same period this year. The reduction in net borrowings and interest expense (about half in nominal interest) that resulted from the signing of the Framework Agreement and Rescheduling Agreement with the Lender Institutions on December 31, 2008 produced a sharp improvement in the Group’s financial performance. Specifically, while the Group reported net financial expense of 5.7 million euros for the first quarter of 2008, it earned net financial income of 0.4 million euros in the same period this year. The net financial position was negative by 125 million euros, compared with net borrowings of 100.1 million euros at December 31, 2008 and 235 million euros at March 31, 2008. The deterioration of 24.9 million euros in the net financial position reflects primarily the utilisation of liquid assets required by changes in working capital that resulted from the downsizing of production activities and a delay in collecting some trade receivables, which customers paid after the end of the quarter. The Group had 1,891 employees at March 31, 2009, down from 2,650 employee a year earlier (-28.6%). An additional 692 employees worked for the Pininfarina Sverige A.B. joint venture in Sweden (853 employees a year earlier). However, the data at March 31, 2008 included 567 employees of the group of French companies headed by Matra Automobile Engineering, which sold all of its business operations on December 31, 2008. An analysis by business segment of the data for the first three months of 2009 shows that the manufacturing operations generated value of production of 44.6 million euros (59.9% less than the 111.2 million euros reported in the first quarter of 2008). Slumping demand in the automobile market and, compared with 2008, the absence of production for Mitsubishi are the main reason for this sharp year-over-year decrease. The EBIT reported by the manufacturing operations were negative by 9.5 million euros, compared with a loss of 6.9 million euros at March 31, 2008. The service operations, which include design and engineering, reported value of production of 21 million euros, or 38.8% less than in the first quarter of 2008, when it totaled 34.3 million euros. This significant reduction in value of production is due in its entirety to the change in the scope of consolidation. Specifically, starting in last quarter of 2008, the companies in the group headed by Matra Automobile Engineering SAS were gradually sold to buyers outside the Group, as were the business operations of their French parent company. With regard to profitability, EBIT for the first three months of 2009 were positive by 3 million euros, almost triple the amount earned in the same period last year (1.1 million euros). Consistent with the guidance provided in the Report on Operations of the 2008 Annual Report, the Group expects to end 2009 with a net loss, but the amount of the loss should be substantially lower and not comparable with the loss reported in 2008. At the end of 2009, both net financial position and shareholders’ equity are expected to show an improvement, compared with December 31, 2008, as a result of transactions executed during the second phase of the Framework Agreement signed with the Lender Institutions, which calls for a reduction in gross indebtedness and an increase in shareholders’ equity by an additional 70 million euros, on top of the 180 million euros booked at December 31, 2008. With regard to this issue, ongoing negotiations are expected to result, relatively soon, in the completion of the process of recapitalising the Group’s Parent Company and the signing of related agreements. No significant events occurred since the Shareholders’ Meeting held on April 23, 2009. The disclosures provided on that occasion should be consulted for additional information.